The Nambucca Shire is situated on the Mid-North Coast of New South Wales. From the coast to the hinterland, it spans the ancient and productive lands of the Gumbaynggirr Nation. The population is around 20,000, mainly Anglo-Celtic but with significant Aboriginal and Torres Strait Islander communities. 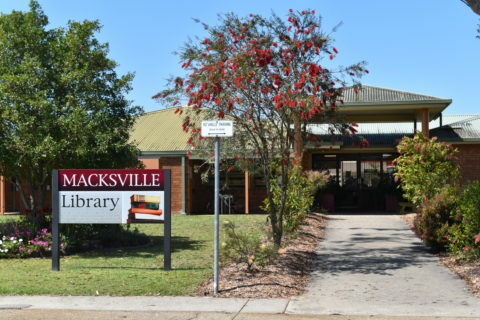 The Nambucca Library Service comprises two branch libraries; one at Macksville, the Shire’s administrative centre; and another at Nambucca Heads, a busy tourist town. Like the rest of the Mid-North Coast, the landscape is spectacularly beautiful. Like other parts of regional Australia, there is enormous creative potential and opportunities for new kinds of work, community connections and cultural experiences. Libraries represent vital cultural infrastructure, and with the right kind of spaces, resources and support they contribute to all kinds of cultural outcomes in regional communities like Nambucca. The challenges for the library service relate to size and flexibility of spaces, adequate staff numbers, and limited opportunities for capital investment due to the small rate base the Shire draws on for its operating budgets. The strategy’s ultimate success will rely on good partnerships. The well regarded Muurrbay Aboriginal Language & Culture Co-operative is situated at Nambucca Heads, the Shire’s busiest town. The well-run Muurrbay Co-Operative is a leader in preserving, notating, teaching and distributing Gumbaynggirr language in a range of media formats. Gumbaynggirr language is taught in local schools, and words like ‘Giinagay’ or ‘hello’ are in frequent use. I was fortunate to meet Muurrbay Co-op members on a number of occasions. We found synergy between Muurrbay’s and the library service’s objectives, and the mid to longer term strategy horizon reflects some of these shared goals.A closer partnerhsip will benefit both parties. Towards the end of the strategy development process, I was asked to help with a grant proposal to extend the Nambucca Heads Library. In late 2018, the NSW Regional Cultural Fund, part of Create NSW, announced its winners. Nambucca Shire was successful, and work has begun. The Nambucca Shire’s Coral Hutchinson and Wes McQuillan were wonderful partners in the strategy journey. I thank them for their generosity, knowledge and enthusiasm for change. Here is a copy of the library strategy.